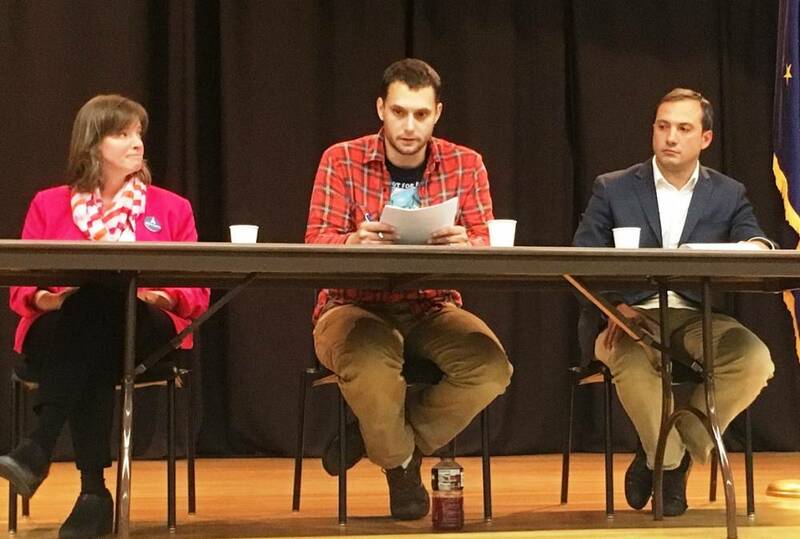 Three Democratic primary-ballot candidates for U.S. House were in Ketchikan for the annual Blueberry Arts Festival. 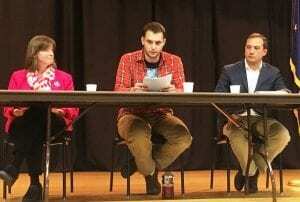 In addition to meeting and greeting the public during festival events, they debated issues Friday during a forum hosted by local House District 36 Democrats. Alyse Galvin, Christopher Cumings and Dimitri Shein each hopes to challenge Rep. Don Young for U.S. House this November. First, though, they need to convince Democratic primary voters that they’re the best choice to defeat Young, a Republican who has held his seat since 1973. 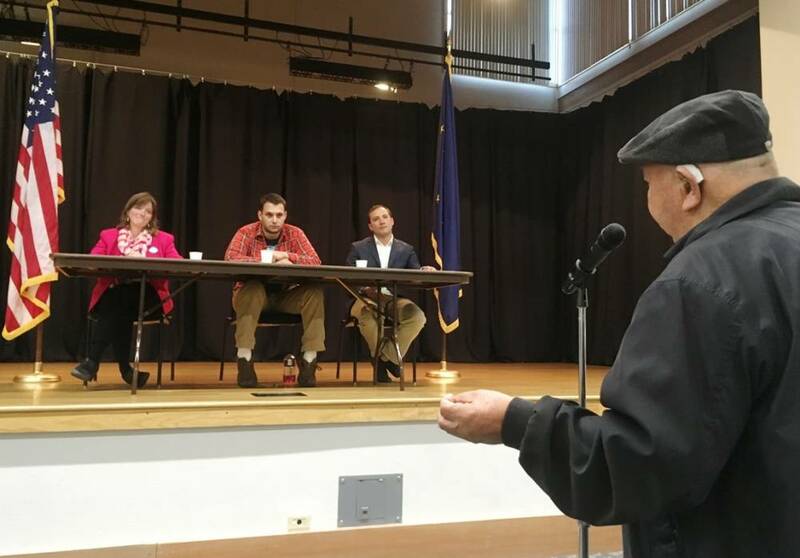 Moderator Tom Schulz and other local Democrats came up with the questions for the Friday-evening debate, which touched on topics important to Alaska in general, and specifically to Southeast. But first, they introduced themselves. Galvin is from Anchorage, and is unaffiliated with any party. She said she’s a lifelong advocate for education. She helped found a group called Great Alaska Schools, which lobbied state lawmakers to maintain funding for public education. Also unaffiliated, Cumings lives in Ketchikan. Like Galvin and Shein, Cumings is new to campaigning. A big part of his campaign is raising awareness of addiction and mental illness. Cumings is a recovering addict, and said his family is relying on the government’s “safety net” to make it through a difficult time. Shein is an Anchorage resident and is running as a Democrat. He immigrated to the United States from Russia when he was 12 years old. Shein said his family fell on hard times and had to rely on social assistance for a time until his mother was able to find stable employment. He’s a former CPA who worked with tribal governments, and later founded his own company. Health care was the first question. Schulz asked how the candidates planned to address concerns with the Affordable Care Act, also called Obamacare. Cumings and Shein both advocate single-payer health care for all. Cumings said the current private insurance system is failing people. Shein said the government needs to reaffirm that health care is a human right. Galvin agreed that something needs to be done. She advocated a variety of solutions, including opening exchanges across state lines to increase competition and lower costs in Alaska. Schulz also asked about economic development and resource extraction. Cumings said he supports an Alaska exemption from the national Roadless Rule, to provide access, although he supports a transition to young-growth harvest. Galvin said she supports maintaining the Roadless Rule for Alaska and encouraging renewable-energy projects while still allowing a multi-use forest. Shein said a challenger to Young needs to provide an alternative economic message, and his is health care for all. Shein said that will bring significant revenue into the state and free up money to pay for other projects. The candidates also talked about securing the nation’s voting system, internet safety, tariffs, the Alaska Marine Highway System, bypass mail subsidies, the U.S. Coast Guard, Arctic development, climate change science, education costs and mining. And here is the official list of all candidates in the Aug. 21 primary election.